Commitments taken at the Paris Summit should act as a tool for Armenia and Azerbaijan to boost their efforts towards settling the Nagorno-Karabakh conflict, OSCE Minsk co-chair said. Commenting on the Minsk Group’s future plans in view of the conflict’s settlement, James Warlick from the U.S. said the belligerents need to intensify their dialogue and strictly adhere to the ceasefire under Paris agreement. “To make a progress towards the settlement depends on these efforts,” warned Warlick. Back in Paris last year, the presidents of Armenia and Azerbaijan both agreed on a series of issues: hostages exchange and missing persons information, all under France’s impetus. At the time, both Baku and Yerevan viewed the meeting as a positive step towards fetching a peaceful end to the conflict. However, a week after the meeting, the Armenian armed forces launched large-scale drills in the occupied Azerbaijani territories, in violation of international law. The drill finally ended when Azerbaijan took down a combat helicopter after it infringed on its air space and threatened troops on the ground. Azerbaijan’s rulers condemned their Armenian counterparts for not fulfilling the signed agreements, including Paris accord, and the corresponding appeals of the International Committee of the Red Cross. 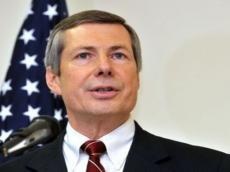 Warlick also called on Armenia and Azerbaijan’s rulers to launch a new phase of negotiations that could end the twenty-year-long conflict and finally bring peace to the region. “The OSCE Minsk Group remains strongly committed to working with the sides on a settlement. And the presidents of Armenia and Azerbaijan, in turn, should find a political will to resolve the Nagorno-Karabakh conflict peacefully. “The co-chairmen continue to work closely with the foreign ministers of Armenia and Azerbaijan in view of advancing negotiations and make headway ahead of the next presidents’ meeting later this year,” Warlick stated. As for the next trip of the OSCE Minsk Group co-chairs to the region, the middleman said the dates for visit have not yet been defined. The Minsk Group’s brokering involvement focuses fully on bringing a peaceful end to the conflict in Nagorno-Karabakh. An armed solution has never been an option on the group’s agenda. That’s why periodical escalations on the frontline by Armenia have been a source of great worry and concerns for the Minsk Group as its commitment is solely to peace. Azerbaijan’s internationally recognized Nagorno-Karabakh territory was turned into a battlefield and zone of aggravated tensions after Armenia sent its troops to occupy Azerbaijan’s lands. As a result, 20 percent of Azerbaijan’s internationally recognized territory stands under military occupation. For the past two decades, and despite calls from the international community, Armenia has refused to withdraw its troops and retreat within its national borders.